Why would you want to paddle tandem in an open canoe? Tandem whitewater canoes are generally big and clunky when compared to solo boats, or sleek, light weight Kevlar touring tandem canoes. When they fill up with water they are very heavy and hard to maneuver. They have the nickname Divorce Boats. One of our friends entered the down river race from Helen to Atlanta with a friend of twenty years who was in great shape but did not know how to paddle. After crossing the finish line, they never spoke again. Does that sound like fun? Well, it can be if you have the right mind set and training. The main pre-requisite for tandem paddling is the ability to communicate with your partner in times of stress. Generally if you can hang wall paper with your prospective tandem partner without coming to blows, you can paddle tandem. A good sense of humor helps too. The two dominant theories of successful tandem paddling are mutually exclusive. The first, to which we ascribe, is to make sure your partner has a great time on the trip. The second theory is to affix the blame early. You may hear paddlers of this school of paddling before you see them. From around a sharp bend in the river comes the sound of shouting, #@&* It, I SAID DRAW!? This statement is usually followed closely by the sound of a paddle connecting sharply with a helmet. Back to the question of why you might want to paddle tandem. Two paddlers in one boat have more power for acceleration or just getting from point A to point B. Attainment is much easier in a well functioning tandem boat. Tandem boats are more maneuverable because you have one paddle in the bow and one in the stern that can work in concert to make the boat turn more sharply, and precisely. Having a paddle on both sides of a boat is the equivalent of having training wheels on a bicycle. Tandem paddlers can throw out high and low braces simultaneously with great resulting stability. With two sets of eyes in one boat, you may see safer routes, and friendlier eddies more easily. Then there is also the element of companionship. Some people just like to have somebody in the boat to talk things over with. If you are considering trying tandem paddling, you may wonder what kind of canoe would work for you. Twenty years ago this month, we started paddling tandem on the Nantahala in a 17 foot Mohawk Intrepid which is a heavy, high-sided, wilderness tripping boat not known for its nimble moves. We had no tandem training and it was a little scary starting out. Since we are writing this article, you may surmise that we both survived the experience. Tandem paddling really can be lots of fun with the right partner and the right boat. Training makes it all the more fun. Any of the GCA open canoe clinics can accommodate tandem boats as long as the coordinator is given adequate notice to line up ACA certified tandem instructors. 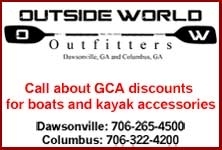 Several instructors in the club will also do private instruction as will commercial operations like The Atlanta Whitewater Center or the Nantahala Outdoor Center.